The changes that occur in normal vision as a person ages are nothing to fear. Even the development of cataracts should not be a cause for undue concern. Monitoring changes in vision, however, is a task that you should entrust to trained professionals who utilize the most up-to-date diagnostic tools, including digital retinal photographs. Ensuring the health of your eyes, and helping you to see the world properly, with or without corrective lenses, is our business. The aging process naturally contributes to changes in vision, just as growing older is responsible for changes to the rest of the body. Among the hardest-working organs in the body, eyes are certainly two of the most important, and regular eye exams by trained professionals can also act as early warnings for other medical conditions, including diabetes, high blood pressure, cancer and liver disease. Sight can be influenced by many factors, including lifestyle, medication, trauma, nutrition and age. Low vision is one of the greatest risks for falls and injury faced by older citizens, and deteriorating vision ranks with decreased mobility as one of the most serious problems of aging. Age-related conditions which affect eyesight include macular degeneration, glaucoma, cataracts and problems associated with diabetes. These conditions are most frequently seen in individuals over the age of 40. 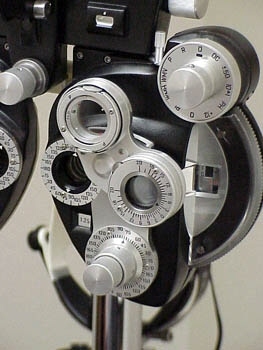 There are, however, simple tests used by optometrists to determine the presence of such conditions. And, even though there are currently no procedures to prevent or reverse macular degeneration and glaucoma, their debilitating effects can be slowed with effective care. Cataracts, which involve a cloudy or opaque covering on the eye's lens, are extremely common. Cataracts may develop over a period of years, causing relatively minor vision changes; or they may progress quickly to inhibit peripheral vision and color perception, cause sensitivity to light and glare, decrease nightime vision, and make normal activities difficult. Sometimes the first clue is the need for frequent changes in prescription for corrective lenses. When cataracts progress to the point of disrupting normal routines, it is time to have them removed. One of the most common surgeries performed in North America today, cataract surgery involves replacing the eye's natural lens with a new, clear plastic implant. The lens replacement nearly always results in restoring vision to the range of 20-20 or 20-40, and a return to normal activity within just a few days. Most people who choose the surgery report that they "wish they had done it sooner." Maple Ridge Eye Care has a team of caring specialists to offer services to your entire family, from preschool vision screenings to senior care for age-related concerns. Have you noticed vision changes in your own eyesight over the course of the last year or so? Do you find yourself squinting in the sun, or hesitating to drive at dusk? If so, call to schedule an appointment, and we'll take a deep look into your eyes.